A Hampshire coach company has been chosen to trial the very latest hybrid vehicle technology. 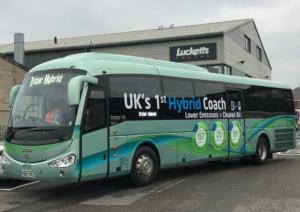 Lucketts Travel has taken delivery of the UK’s first hybrid coach and eagle-eyed motorists will be able to see the distinctive blue and green coach on the county’s roads over the next two weeks as drivers test out the vehicle. It’s hoped the trials and subsequent feedback will help to accelerate the bus and coach industry’s use of alternatively fuelled vehicles. The Irizar i4H can reduce fuel consumption by more than 20%, with consequent reductions in greenhouse gas emissions and improvements in local air quality. It works through a mixture of traditional diesel engine technology and electricity. It runs purely on electricity when driven at low speeds and the diesel engine kicks in when accelerating or cruising. The Irizar i4H has ‘regenerative braking’, which means it recharges itself while the driver has their foot on the brake. Mark Jordan said the feature would be particularly useful during rush hour journeys on roads such as the M27 and M3, which often have heavy traffic. Managing director of Lucketts Travel, Tony Lawman, said: “When it comes to improving air quality it is essential that coach travel is recognised as being one of the solutions. While coaches make up a very small proportion of vehicles on the road, we recognise that Lucketts is a big coach operator locally and we have a responsibility to look after the environment for the community we operate in. That’s why we’re working very hard to do everything we can to reduce our impact on the environment. The hybrid will coach be out on the south’s roads over the next two weeks, undertaking tasks such as providing rail replacement services and transporting workers to big business parks as part of corporate park and ride schemes.